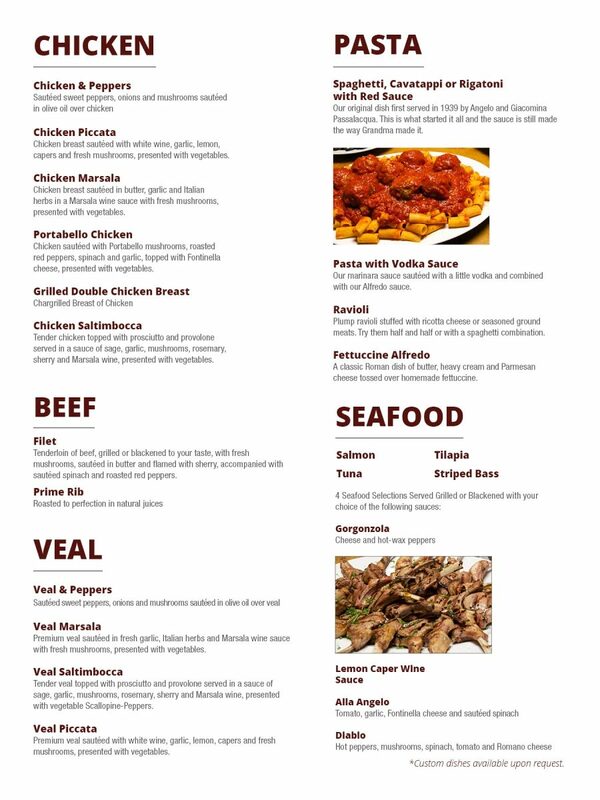 Build your family style meal by first choosing a package option and then select an item from each category. We specialize in “family style” service. Simply, this means delivering platters of food to each table and the guests “pass” the platters just like any family meal, thanksgiving meal or other celebration. 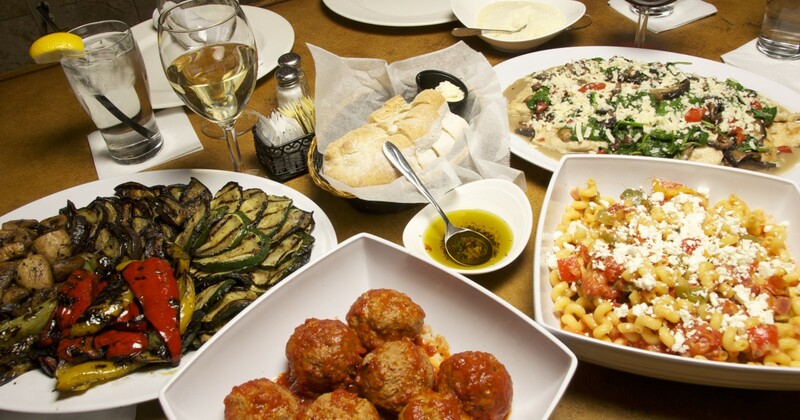 This is the way all Italians celebrate. It’s hearty, festive, social, and redolent in good cheer. Family style has many advantages over buffet style or plated entrees in our view. First of all, it treats your guests like guests. They don’t have to get up and get their own food. In a buffet setting for 200 people you would need 4 buffet lines to properly take care of this number, but that never happens. You get one buffet line and 50 people are done eating, 50 people are eating, 50 people are in line and 50 people are waiting to get in line. It takes forever to take care of your guests. It also involves in our view, over portioning. With a plated entree, your guests have to indicate what they want to eat months before the wedding. It is noted on the invitation. 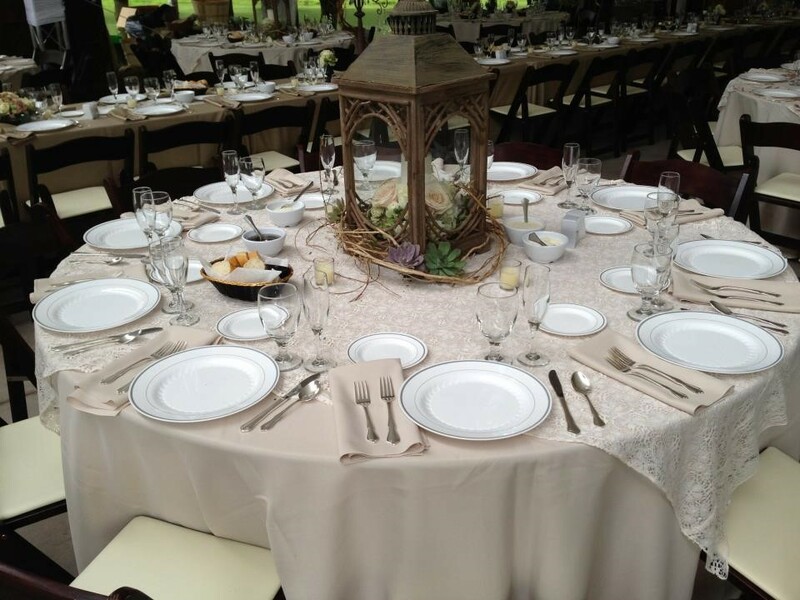 Your wedding coordinators have to maintain and moderate the numbers, mark each seat with the appropriate entree make sure the appropriate number of guests correspond with the appropriate dishes. And it takes a lot of time to serve all the tables. We don’t go to a wedding to spend 2.5 hours eating. We go to a wedding to have a good time and to celebrate. Family style service is very quick, very fresh, very hot and very efficient. We can serve 200 guests or 21 tables in minutes. We can put salads on the tables at let’s say 6:15 and be clearing dinner and putting dessert out at 7:30. The band or the DJ can kick it up earlier and the party happens!!! We would love to discuss this style with you. 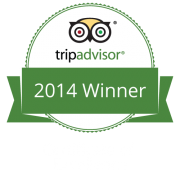 We are very successful at this and have lots of references from happy guests. We also do buffet service and we do it well. We own the equipment necessary to provide this type of service without rental fees. We do not do plate service. We do not own the equipment necessary to provide that service. But nobody but nobody does family style like we do. 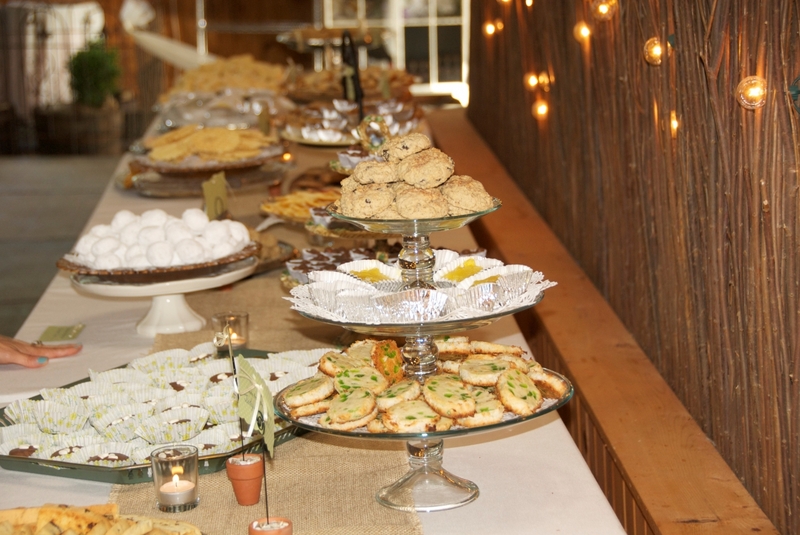 Catering prices do not include labor, rentals, equipment, supplies or other tangibles. 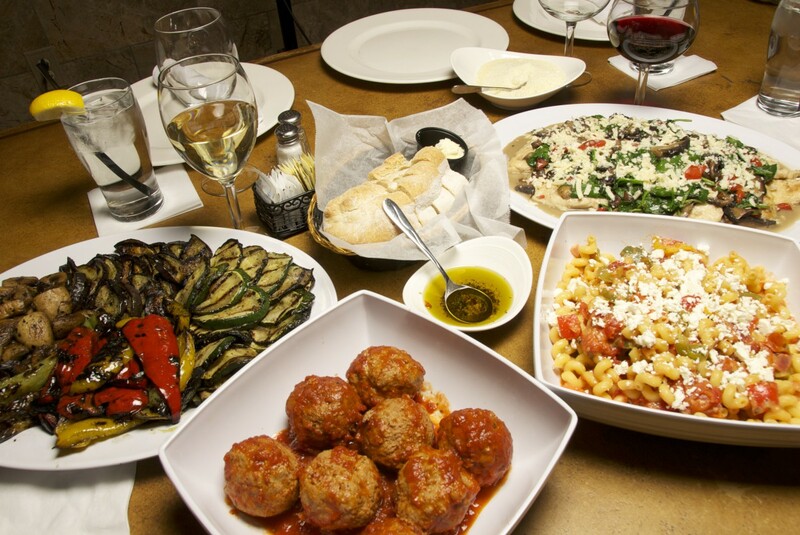 With family style service we recommend one server per 20 guests. We use 5 staff in our catering kitchen. The day is an 8 hour day for the staff at the restaurant and on site that includes, preparing, loading, delivering,, setting up, production, serving, cleaning up, tearing down, returning to our restaurant, unloading, cleaning and storing. 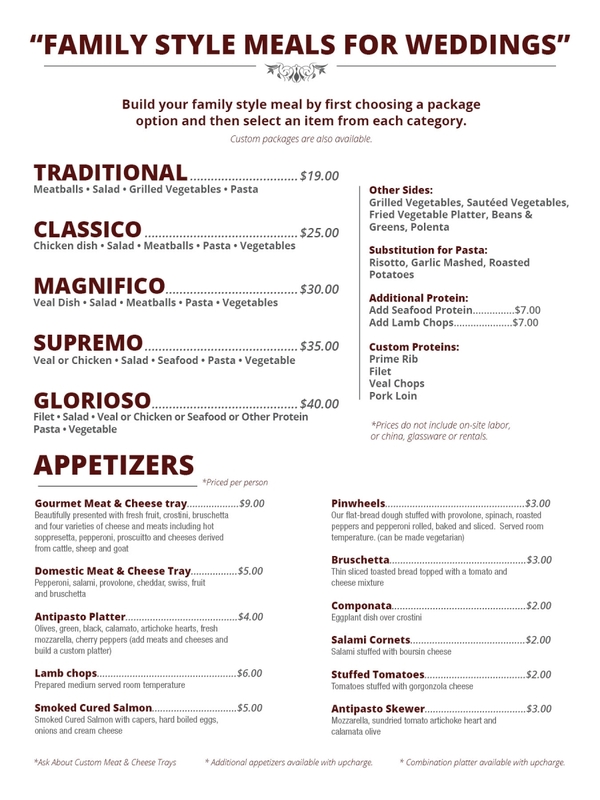 A 20% gratuity is added for our service.